In our clinic, you will find modern physiotherapy and rehabilitation programs implemented by our expert team, who always work with a positive attitude. And you can be sure that we will use the most suitable technology and methods for the treatment of yours and your relatives’ disorders. 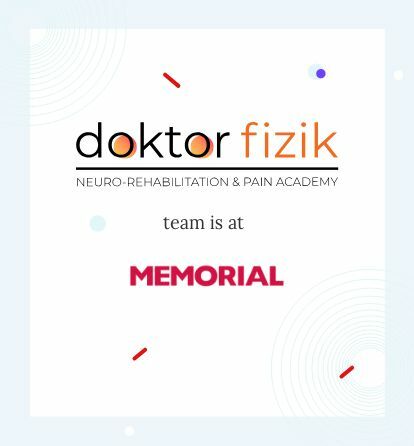 In our DoktorFizik (Physiotherapy and Rehabilitation) Clinic, you can find medical support for stroke (hemiplegia) and brain injury and neurorehabilitation for many other conditions. The balance laboratory, hand&arm laboratory and gait laboratory and comprehensive and high-technology robotic physiotherapy devices and our experienced team is ready to give medical care and treatment service for all disorders requiring robotic physiotherapy. Comprehensive gait analysis, diagnosis, treatment, and rehabilitation service for patients, who complain from spinal column injuries, brain injuries or diseases causing nerve, muscle and bone injuries. In the gait laboratory, our experts are focused on the gait functions and balance. Hand&arm laboratory, which is equipped with robotic rehabilitation devices designed especially for the development and strengthening of the grasping and stretching skills and managed by our experts. In this laboratory, our experienced staff is focused on the recovery of the hand, arm, and finger functions. In the balance laboratory, which is designed for the recovery of the balance and motor functions, the patients were directed to the correct treatment options after a detailed balance/coordination and mobility/function evaluation by our physiatrists and rehabilitation specialists. The robotic treatment, which is preferred for the rehabilitation of both upper and lower extremities after stroke, is implemented with the help of computer-assisted rehabilitation devices. These devices enable the practice of the assisted (focused on an imaginary target) or passive movements. Patients with stroke or brain injury, who apply to our physical therapy clinic from all over the world, are treated by our experienced team with neurorehabilitation techniques based on international standards.